Let us help you find great value pet insurance through a panel of insurers, which quickly compares prices and features from insurers such as Animal Friends, Computerquote, Green Insurance Company, Helpucover, PetPalsDirect and Protect your Bubble. Pet Insurance with Holiday Cancellation benefits, Death Benefits or Boarding Fee cover are all available. Quickly identify the insurance that will suit your needs. There are four basic types of pet insurance cover available: 'per condition with a time limit', 'per condition', 'per condition, per year' and 'lifetime'. Click here for more information. 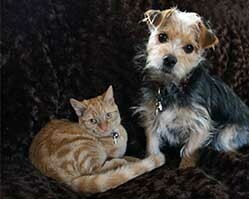 Most policies also offer a variety of other benefits related to your pet. These include Death Benefit which will cover the purchase cost of your pet; Holiday cancellation and curtailment if you have to cut a holiday short if your pet needs treatment and Boarding Fee cover for your pet if you go into hospital. These policies provide a set fee limit and 12 month time period for treatment. For example, a policy offering a £2000 vet fee limit and a time limit of 12 months means that the policy would pay out up to £2000 for the cost of treatment of a condition with a 12 month time limit for the treatment to be provided. Once either limit is reached, no further cover is given for the condition claimed for. Your pet can be in the middle of treatment when cover stops. These policies specify a maximum cost for treatment for a particular condition but don't apply a time limit for the length of treatment. As Per Condition cover but, provided you renew your policy, the vetinerary fee limit is also renewed. These policies provide cover up to a set fee limit with no time limit applicable. The fee limit will be refreshed if the policy is renewed. These policies are suitable for long term chronic conditions but as a result are more expensive.